One clause that is mentioned in the job agreement is related to the termination of the employee. The company reserves the right to terminate any employee but with the initiation of a notice and notice period thereafter. This is a written document used by many organizations as a guideline to the terms and conditions of termination of an employee. Termination of an employee is a complex process. Sometimes it is emotionally difficult to let go an employee and at other times it may be legally hard to terminate anyone. 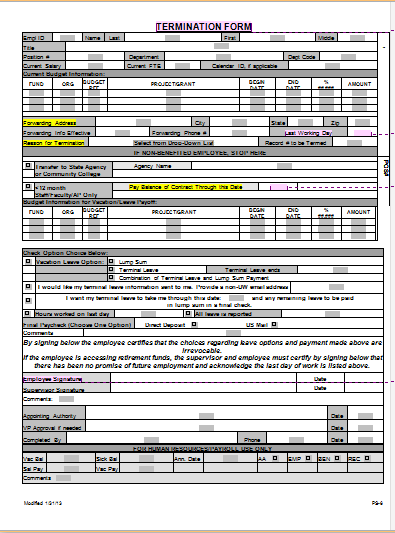 This termination form is a necessary part of the procedure needed to follow a termination process. It includes the date of termination as well. Termination is a very critical process and must be handled with utmost care and diligence. Any malpractice or careless mistake on part of the organization’s human resource department can lead to severe consequences due to legal proceedings or litigation by the employee. So it is important to handle the issue with great intelligence and care.